Eat. Live. Laugh. and sometimes shop! : Bear Candelier. 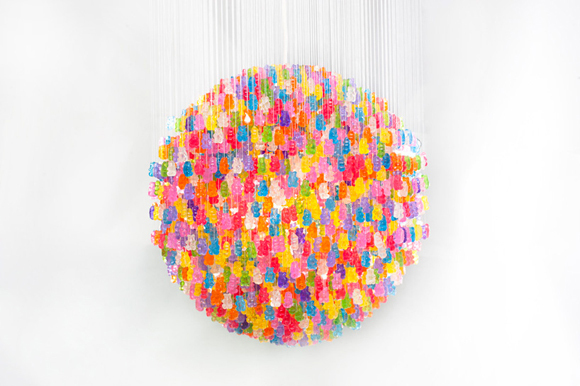 The 'candelier' chandelier, by New York based artist Kevin Champeny, is made up of 3,000 hand cast acrylic "gummy" bears . The polychromatic light fills a space with a cool saccharine glow. 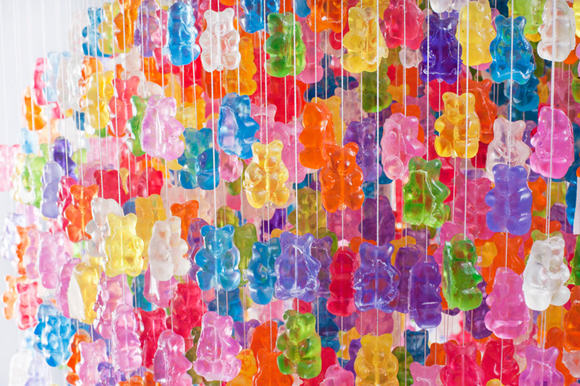 I'm pretty sure Little Miss Thang would love such a focal point in her room. Talk about sugar plums dancing in your head. Sadly, the $2,400 price tag guarantees it will never find a place in our home. Too bad, though, because I'm totally loving it! Any sugar plums dancing in your head this season! What have you seen that astounded you lately?